Search for all "RIPK3 / RIP3"
Mouse anti Human RIPK3 / RIP3 OTI2B10. 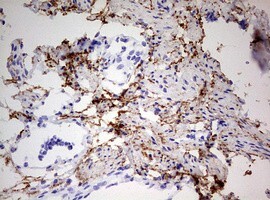 Human recombinant protein fragment corresponding to amino acids 233-518 of human RIPK3 (NP_006862) produced in E.coli. 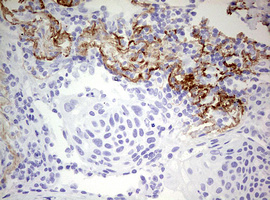 The product of this gene is a member of the receptor-interacting protein (RIP) family of serine/threonine protein kises, and contains a C-termil domain unique from other RIP family members. The encoded protein is predomintly localized to the cytoplasm, and can undergo nucleocytoplasmic shuttling dependent on novel nuclear localization and export sigls. 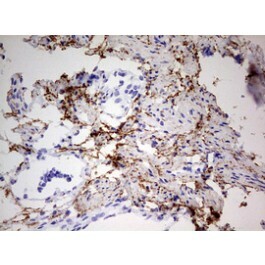 It is a component of the tumor necrosis factor (TNF) receptor-I sigling complex, and can induce apoptosis and weakly activate the NF-kappaB transcription factor. [provided by RefSeq, Jul 2008].